The Sunrise area at Mt. 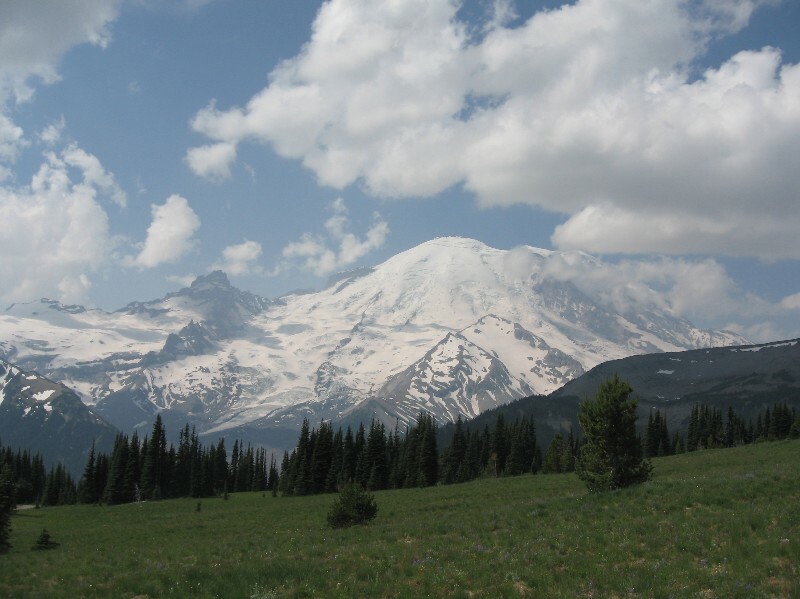 Rainier National Park is one of the most beautiful places on the planet, in my humble opinion. Because of the altitude and the latitude, the seasons change rapidly there, too. This summer, I visited Sunrise on July 14th and August 4th. Only three short weeks apart. And here are some of the changes I saw. The mountain itself looks very much the same, but you’ll notice that the foreground does not. In July, the snow was still heavy on the ground. In August, I had to cross only one patch on the trail. Two views of the same hillside above the parking lot. Not only is the snow gone in the righthand photo, but the grass is much greener. 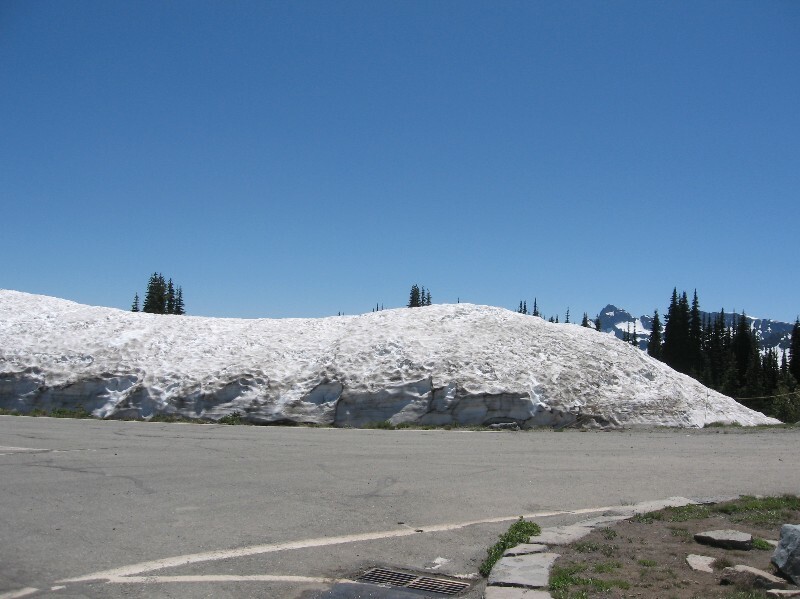 Snowbank in July. Completely gone in August. 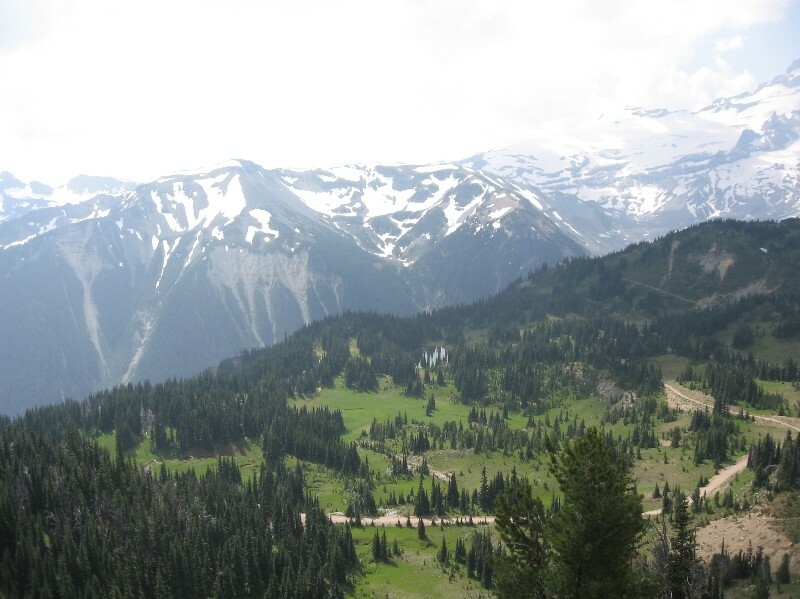 If you look closely on that large gray patch just above treeline, you’ll see a line going across that rocky slope. It’s a trail. That’s where I took the second picture from. The brown line across the green meadow T-ing into the wider trail (which used to be a road, but is being rehabilitated) is where I took the first picture from. Early in the season, there are lots of blossoms, but only a few species. 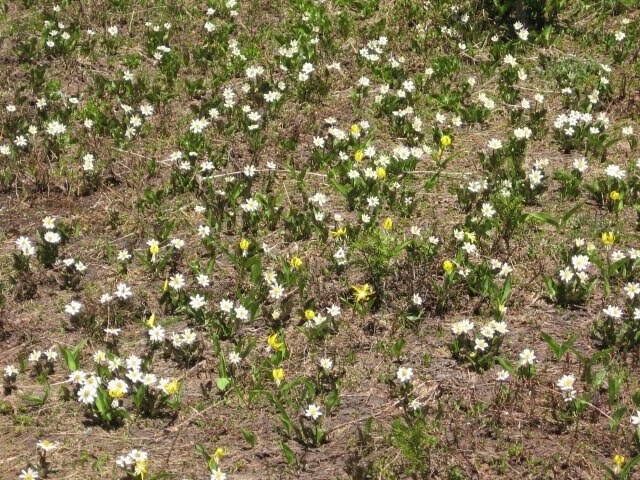 These on the left are white spring beauties and yellow glacier lilies. Along with pasque flowers and the earliest phlox blossoms, they’re about it. Later in the season the reds (two kinds — rust and magenta) of Indian paintbrush and the pink and white of heather in the righthand picture are two of at least twenty kinds — lupine and more phlox, several kinds of daisies and asters, penstemon (I saw three kinds on the fourth), Jacob’s ladder and veronica, false Solomon’s seal, and on and on and on. I love the changes at Sunrise every year. I have been up there in every month from June, when the road opens for the season, to October, when it closes. It’s different every time. Living only two hours from Sunrise makes me one of the luckiest people on the planet. And that’s not just my humble opinion. 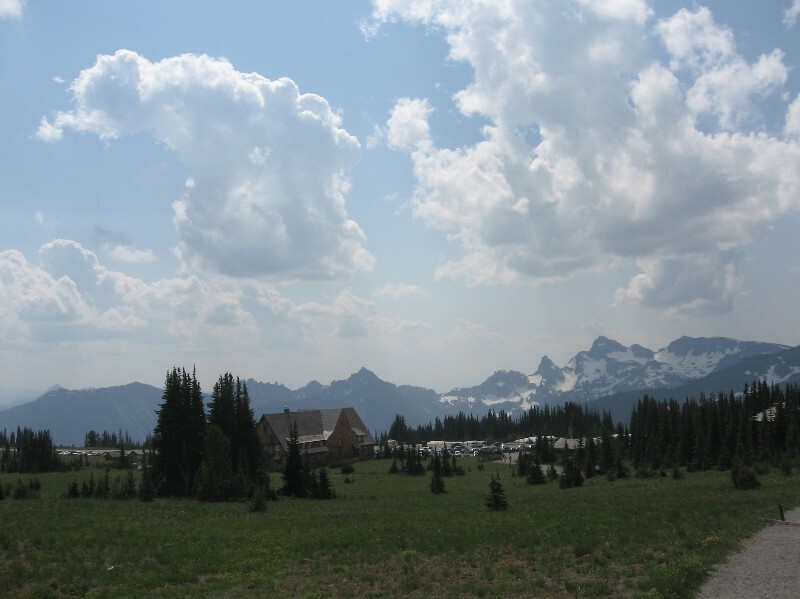 What places near where you live make you feel lucky to have them? Beautiful! I've never been there…maybe one day. My oldest favorite places are the southern Appalachians. (Yes, they're old, but I also mean I've had a bone-deep relationship with them since I was a kid.) As an adult, living in Wisconsin, I have to say 1. the prairie landscape and 2. the Great Lakes, especially Lake Superior. Excellent choices [g].I love the Appalachians, too. I drove the Blue Ridge Parkway 11 years ago, at the peak of foliage season, and kept dropping my jaw on the steering wheel because of the beauty.And I love the Great Lakes, too. I used to live on the shore of Lake Erie (in the small tourist town of Port Clinton, Ohio, about halfway between Toledo and Cleveland), which was wonderful. We even saw a waterspout once [g]. I've never been to the White Sands National Monument, but I've been to Coral Sand Dunes State Park in southern Utah, which is very much like that. I was most impressed. The sand there is exactly as advertised — bright coral in color, and as fine as sugar. Beautiful stuff.